Eliminate bugs before they eliminate your paint and glass! Diamondite Bug Eraser™ Waterless Bug Remover is a specially formulated cleaner that safely removes bugs from paint and glass. This clear coat-safe bug remover starts softening and loosening the bug remains on contact so you can easily wipe them away. Diamondite Bug Eraser™ Waterless Bug Remover is gentle on paint and glass but tough on bugs! If you drive, you have no choice but to deal with bugs on your clean paint and glass, but you do have a choice of how to remove bugs. Many spray-on bug removers are designed to dissolve - eat through - bug remains. What's to keep these high octane cleaners from etching the clear coat? Diamondite Bug Eraser™ Waterless Bug Remover is formulated to soften bugs and break their bond with the vehicle, not dissolve them. Gentle rubbing with a soft microfiber applicator will release the bugs easily. This gentle approach to insect removal spares your vehicle's paint finish any harsh chemicals. If you meticulously maintain your vehicle, you can appreciate the care we took in formulating a bug remover that is safe on auto paint. Diamondite Bug Eraser™ Waterless Bug Remover eliminates the bugs only, not the paint. As insects break down, enzymes are released that are capable of etching paint. 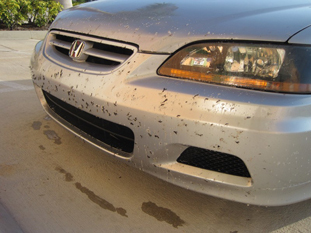 Large bugs, like Florida's Love Bugs, produce a lot of enzymes, which can lead to larger blemishes on the paint. Diamondite Bug Eraser™ Waterless Bug Remover neutralizes these enzymes to stop their destructive effects immediately. Apply Diamondite Bug Eraser™ Waterless Bug Remover as soon as you notice bugs on your vehicle to prevent the secretion of enzymes and etching. 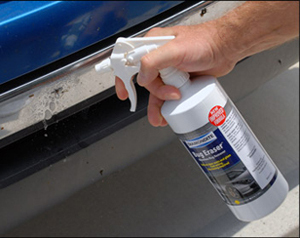 Diamondite Bug Eraser™ Waterless Bug Remover is safe and effective on paint and glass. Use it on the windshield to completely remove bug remains and restore a clear shine. To help you remove bugs and protect your vehicle, Diamondite Bug Eraser™ Waterless Bug Remover is available in the Diamondite Bug Eraser™ Kit. The kit includes three steps to remove bugs, clean glass, and seal and shine the treated area. Diamondite Bug Eraser™ Waterless Bug Remover is the perfectionist's approach to bug removal. It removes bugs safely and effectively without harsh chemicals. Shouldn't everything that touches your vehicle be gentle? 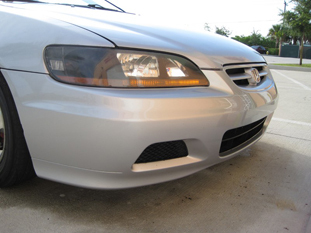 Paint: Spray Diamondite Bug Eraser™ Waterless Bug Remover onto the desired area and allow it to dwell for 30 seconds. Rub the area clean using a soft microfiber applicator. Glass: Spray Diamondite Bug Eraser™ Waterless Bug Remover onto the glass and allow it to penetrate the bug residue for 30 seconds. Rub the area clean with a soft microfiber applicator. Next, use Diamondite Perfect Vision Glass Cleaner to remove any remaining residue and restore clarity. Seal and protect the treated area using Diamondite Crystal Gloss™ Surface Protectant.